Ba Gua means ‘eight gua’. A gua in Chinese can mean a three lined binary figure (trigram) or a six lined figure (hexagram). The legend goes that anciently, Fu Xi, the first sage, a figure of prehistory, introduced the people to hunting and fishing and taught them the Ba Gua. Looking up, he contemplated the figures in heaven, looking down, he saw the traces of birds and animals on the ground. He created the first model of the world, consisting of eight elements, the Ba Gua. In English we call them the eight trigrams. 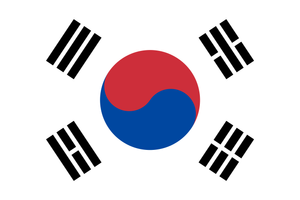 You can see four of them on the flag of South Korea, surrounding the Tai Qi, the intertwining figures of Yin and Yang. Here is a talisman commonly used in Feng Shui that shows all eight, along with the Chinese names in characters and Pinyin. In this course you will learn to use these figures to aid your meditation. Eventually, if you apply yourself to the work, you will learn the next phase of the ancient Chinese model of the universe, the 64 hexagrams of the Yi Jing (I Ching). To know the hexagrams by heart, and be able to write them out without error, not referring to a chart, is the criterion for gaining the status of an Yi Dao Student. By learning the trigrams you will gain the status of Yi Dao Novice. You will see at the top of this document a set of eight schematic drawings. These represent the Ba Gua in the ‘family order’. Each of the trigrams has various associations. Here is list of attributes of the Ba Gua on the web. You will not have to learn all of these, just enough to internalize the trigrams and give them significance to you. The trigrams are a model of the universe, but they differ for each person, because that is the nature of reality. 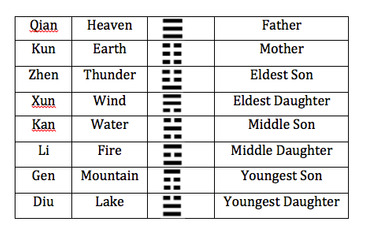 Here is one way of displaying the family order of the trigrams. It is divided by the Yin and Yang trigrams. Note that when a trigram has one Yang and two Yin, it is a Yang trigram. Today we will discuss the first two trigrams, Qian and Kun, commonly called Heaven and Earth. But they have many attributes and are the foundation of all the others, thus they are the father and mother of the family of trigrams. They are also often called The Creative and The Receptive. In the schematic they are look like a dome of heaven open below, and the valley spirit of earth open at the top. In the traditional way of drawing them they are pure and symmetrical, Qian is all Yang, all unbroken lines. Kun is all Yin, broken lines. Qian is the external, Kun the internal. Thus in traditional societies the man deals with affairs outside the house and the woman within its walls. This division of labors in mutual and loving in a properly functioning family, with each having opinions and positions, but deferring to the spouse who rules the respective realm. Yi Dao Jia, the ritual order which teaches the doctrines and practices of Yi Dao, is also divided into inner and outer orders. Hexagram 11, Tai, Arising, shows the Qian male principle of heaven rising into and supporting the Kun principle of earth. It is favorable and shows a time when the ‘great is coming and the small reduced. Please note that a hexagram is read from bottom to top, and time progresses in its lines from bottom to top as well. Hexagram 12, Pi Declining shows heaven and earth in decline. They are moving away from each other, earth sinking down and heaven rising up. Seen as a progression of lines the Yin has taken the first three places and is about to displace the Yang above…summer turning to fall. Study the attributes of the Creative and the Receptive until you gain and understanding of them in your own world view. Consider that they function in all contexts. So in some instances Qian may be a king and Kun his queen, but in others Qian is an emperor and Kun his minister of state. Also remember that just because we are born, live and die on a planet, the universe is a very large place, and the figures of the Yi represent all of it. So these are not just heaven and earth or man and woman, but underlying principles on which reality itself is based. Breath in while visualizing the schematic of Qian, then slowly breath out, visualizing Kun. Do this you are comfortable with the practice, then switch to the traditional trigrams, again visualizing Qian on the in-breath, Kun on the out. Do this with your eyes open, in a quiet place. Eventually you will learn to use Yi Dao in any environment in which you need an island of peace and unity with the cosmos. Start slowly. Doing this for a few minutes, until you are comfortable with the practice. You can add your own techniques as you go. Qian and Kun are pure Yang and Yin. Nothing pure exists in the world, nothing perfect. Every crystal has an imperfection. Every cell has a flaw. If you open a barrel of pure alcohol, it will instantly become less pure because it takes water molecules from the air. Thus the six child trigrams are all manifestations of the parents, Qian and Kun, in reality. If things are perfect, they do not change. If they change they are born and they die. Thus we have the paradox of reality. If there is imperfection there is change and thus life and death. If there is perfection there is no change and thus stasis, which is worse than death. Nothing changes, nothing improves, nothing evolves. Zhen, the first son, has a Yang line at the bottom that is pushing upward, motivating and exciting the two Yin lines. It is the Yang power’s first manifestation in reality. The characteristics of Zhen are movement, excitement and raw power. Zhen is brash, frightening all around as it takes its natural place as leader, successor to Qian on earth. Thunder booms and all of nature breathes its relief, because the first son has come, spring returns, and the earth awakens, and the crops can be planted. An earthquake! The earth shakes and the tectonic plates move, reforming the world through primordial power. Xun, the first daughter, has a Yin line at the bottom and two Yang lines above. It is the pervasive strength of a wise woman. Like Zhen, Xun is a trigram of motion, but it is the pervading and penetrating motion of the wind, and the gradual incursion of wood, reaching into the sky and engulfing objects and digging deep into the soil with roots. While Zhen is sudden and imposing, Xun is gradual and gentle. But as all the trigram pairs, they are equals. Think of the formations in the desert, great masses of stone carved over millions of years by the wind into fanciful shapes. The wind is a great force and wood is the essence of patient and persistent growth. Add Zhen and Xun to your meditation, but perform the meditation as Qian and Kun breathing for five minutes, then Zhen and Xun breathing for five minutes. Four is an unlucky number in Chinese and the only place in Yi Dao where there is a cycle of four is the Younger and Elder Bigrams, which we will cover in another lesson, so we will separate out the trigram pairs until you complete the Ba Gua lessons and are able to do Ba Gua breathing. Supplementary reading for the week: The Great Learning, one of the Confucian ‘Four Books’ that formed a key part of the civil service exams and were known by heart by all scholars up until the first Chinese revolution of 1911. Concentrate particularly on those parts of the text concerning family, and the roles of members of the family. The middle children, Kan, water, and Li, fire, are the stable presence of Qian and Kun in reality. As we said above, pure Yang and pure yin cannot remain in the world. They are immediately diluted, and we see that dilution in Zhen and Xun, both forces that change asymmetrically. Kan and Li, like their parents Qian and Kun, are symmetric. They are the same no matter how you turn them, while the other four children turn into their opposites when reversed. Kan is associated with danger, and the original character showed a pit trap filled with water. Kan is also the trigram of business, because you cannot make a profit if you do not engage in risk. Li is fire, but it is also clinging, as the flame clings to the object which burns. The exercises for this week are: Add Kan and Li to daily meditation. The youngest children, Gen, mountain, and Dui, marsh. With these two trigrams we complete the world. Mountains and marshes represent paired opposites, the mountain earth thrust up toward heaven, the marsh that which is wet and still, the murky depths. Now that we have all of the trigrams memorized, look at the interaction of Yin and Yang. The trigrams and hexagrams move from bottom to top. Line enter at the bottom and move upward. So after the parent trigrams of Qian and Kun we have Zhen. Its first line is Yang, and the remainder Yin. So we see in it the first thunder of spring, when Yang Qi arise from the earth and excites the world. In Xun we see that Yang, when it is at its fullest, begins to convert into its opposite. The first Yin line appears at the bottom, the eldest daughter, looking after the rest of the children like another mother, having the greatest amount of strength of the daughters, inherited from the father. Here in Gen and Dui we see the opposite end of that progression. 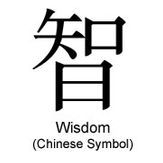 In Gen the last Yang line left is at the top…and is about to leave, making the trigram Kun and completing the cycle. Again in Dui the last Yin line is at the top…and the next movement will make it Qian. Thus the cycle of the Ba Gua is complete and returns to Qian and Kun. Add Gen and Dui to daily meditation, thus completing Ba Gua breathing. Start to do Ba Gua breathing at times outside of meditation, a few cycles at a time, for centering and stress relief. We now embark on the fundamental practice of Yi Dao meditation (Yi Dao can translated as Easy Path or Path of The Changes)--meditating on the 64 hexagrams. Rather than start on the hexagrams right away, however, we will return to the foundations of reality. The picture above shows the ‘tower’ of my Yang-day ritual circlet. You can see that there are three sections, the sphere at the top, the Tibetan disk bead in the middle, and a Chinese cash coin at the bottom (a round coin with a square opening in the middle for stringing; the round and square represent heaven and earth, most are 18th century coins from the Qing Dynasty, a few going back as far as the Han). Usually, but not always, round, this represents both the Tai Qi, which precedes all, and Yang and Yin, the two elements that constitute all things in the universe. The single line representing them, broken or unbroken, is of course sexual in its symbolism. The four images. These are four in number, but do not correspond to the four elements of the western symbolic systems. They are complete in themselves, and reveal the first instance of the progression of time. The order for meditating the four images is: Two Yin (Elder Yin), Yang on Bottom Yin on Top (Younger Yang), Yin on Bottom Yang on Top (Younger Yin), and Two Yang (Elder Yang). This progression is different from the motion we see in the hexagram lines, and represents a binary progression. This symbolizes the difference between how things occur on the micro and macro levels. The Ba Gua, which we have already studied. Below is a chart showing the progression. Note, however that the Four Images are not shown as we meditate them. When we begin to meditate the number of fingers we use to hold the progressing elements of the circlets tower match the number of the elements themselves. After ringing the bell, we start by curling our finger around the circlet to support it and putting two fingers on either side of the crowning stone, then four fingers on the disk for the four images, and finally eight fingers (all but pinkies) on the Ba Gua coin. All of this is done with the eyes closed and each pair of figures is breathed in and out, with the outbreath longer than the in. With the start of the hexagrams we open our eyes. The first two hexagrams, Qian and Kun, are special, and the breathing for them is as well. Qian gets three breathes, one for the bottom trigram, one for the top, and one for the whole. This represents the ‘Three Powers’ of heaven, earth, and humanity. Kun gets two breaths, bottom trigram and top. At the end of Kun we ring the bell. This symbolizes that we the unrevealed universe is complete. After this we begin on the 62 remaining hexagrams. Continue Ba Gua breathing. Learn to do the meditation of the tower elements. 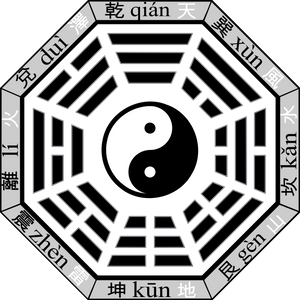 There are not schematics for the Yang/Yin and Four Images sections of the tower, but continue to alternate the trigram and schematic versions of the Ba Gua to get comfortable with them. Knowing the schematics and trigrams will make the 64 hexagrams more meaningful, as you look at the images of how the hexagrams are composed, fire below wood, for instance, representing family. The family hearth is a classic image of home in all cultures. Reading is review of readings previously given. We now reach the bulk of the circlet, the 62 hexagrams that follow Qian and Kun. They are grouped as seven hexagram beads, then a larger bead at the end of the row. In training circlets (before the student has memorized the 64 hexagrams), the larger beads are all of the same type. In a full circlet each of them is different. By tradition there are seven end beads, even though there are eight rows of hexagrams, because the 64th bead is next to the Ba Gua coin, and a large bead would not work there. Each of the 64 beads represents a hexagram, and by convention they have certain shapes. This helps the fingers acquire a memory for the hexagrams, not letting the meditator get lost along the way. One bead is larger than the others though it is not at a row end, number thirty, Li, Fire. That is because this is the traditional division point of the text, not after 32 of the 64. They are divided into 30 and 34. Begin to use the traditional and schematic sheets to meditate. There are two ways of breathing the hexagrams, and in the beginning it may be easier to use the slower one. Slower method: Look at a hexagram on the chart and breath in, visualizing the bottom trigram you and its alternate form. In other words, on a Yang (odd-numbered) day, you will be looking at the traditional hexagrams and for each trigram visualizing the schematic form. For a Yin day you will be doing the opposite, visualizing the full trigrams for each schematic on the chart. Now breath out and do the same process for the upper trigram. So each hexagram will take two full breaths to visualize. Remember to go from bottom trigram to top and to keep you eyes open. Faster method: Breath in the bottom trigram and breath out the top using the same method above, visualizing the opposite symbol, schematic or traditional. Reading: Obtain the following book and begin to study it: Analects: With Selections from Traditional Commentaries by Edward Slingerland (ISBN 0872206351). Read as much each day as you are comfortable with. It can be as little as a verse or as much as a chapter, but I recommend a slow, careful reading of the Master’s words with the commentary. Yi Dao is a Confucian tradition, and the Analects are fundamental to our world view. When we begin formally doing Morning and Evening Reading, the Yi Jing and its commentaries are read at Morning Reading and the Analects of Confucius at Evening Reading. Of the two, Morning Reading is considered more important. But maintaining Evening Reading is also part of the tradition. There is a lot of context needed for understanding Master Kong (Kong Zi, translated into Latin as Confucius, means Master Kong). The complexities of early Chinese society often show through the text, such as the interchange of ritual gifts and its protocol. Slingerland’s excellent translation of the traditional commentaries helps cut through the fog for the western student. The one point of contention I have is his interpretation of the saying: “If I were granted 50 years of added life I would devote them to the Yi and thus avoid errors”. It was this verse that first brought me back to the Yi, which I had rejected previously. Knowing that the Master respected it changed my perspective. It has become popular in recent times to reinterpret the verse to exclude the Yi from the verse and I don’t agree with it. This section will introduce a few details of ritual that have formed over the years I have been doing Yi Dao meditation. The student is free to vary them as they wish and establish their own, but I want to give them an idea of which ritual practices I have found useful. Before getting into the details of Morning Reading, etc., let’s talk about counting. I maintain a counter of 64 beads that is used exclusively to keep track of the number of Yi Dao circlets I complete, one bead for each 64 circlets meditated. I keep count of the 64 circlets on a small metal counter like you might see someone using at a retail store or attraction to keep track of the number of visitors coming in. After I accrue 64 circlets I zero it out and move one bead on the ‘Grand Circlet Counter’. So when you have complete 64 cycles of 64 circlets that is a Grand Circlet. Those who have completed these 4096 meditations are entitled to recognition for their persistence and discipline. Meditation that uses the tower of the circlet, preparing a new circlet, Morning and Evening Reading, the start of Sabbath, etc., are not counted. About the full and abbreviated set of Yi Dao circlets. An inner circlet that is worn next to the skin. This is the personal circlet of the practitioner and the minimum required for meditating with a circlet. The crowning stone of this circlet is touched to the forehead of our dead to maintain our memory and connection to them. It can be passed down to a loved one or disciple after the practitioner’s death or buried with them. Two ritual circlets, one for Yang days and one for Yin. A ritual circlet is differentiated from a normal one by having a metal bead at the 60th hexagram. There are two ritual circlets that do not have a metal 60th hexagram, and are much larger than a normal circlet. These are used on ‘state occasions’ by the prelate of Yi Dao and are rarely seen. Although called Morning Reading, it does not necessarily have to be done in the morning, it just has to be done before Evening Reading. Usually it is best, though, to plan ahead and get up early enough to accommodate 20 minutes for Morning Reading. It makes for a more focused day. The process for Morning Reading is simple, and consists of three parts, meditation, reading, and reporting/journaling. First thing in the morning take your inner circlet (the one worn against the skin) from it’s place on the left side of the circlet box cover. Put it on, the Qian bead on the left side. Put the outer circlet for the day on, the Qian bead on the right. When putting on a circlet, touch the crowning stone to the center of your forehead first. Put a meditation chart in front of you. Even those who have memorized the hexagrams still use a chart in ritual meditation. On a Yang day we look at the schematic meditation chart and visualize the traditional hexagram figures. On a Yin day we look at the traditional chart and visualize the schematic images. You may either use two charts, one schematic one traditional, or print them on both sides of a sheet and turn them around for the appropriate days. Touch the crowning stone to the center of your forehead. Lay out a mat large enough to hold your divination journal and a copy of the Yi Jing for the reading. Place the Yi on the left and the journal (I keep mine open with a leather book weight) on the right. Place the bell behind the mat and get comfortable in your chair, with the bell ringer within reach. Ring the bell once (I use a large brass chakra bell from India). Take up the appropriate ritual circlet for the day. Meditate the tower as shown in Chapter Two, Section 1, and Qian and Kun. Go through the hexagrams up to number eight at the end of the row. Hold the circlet so that it is supported, starting with the tower end in your right hand and the other end looped over your wrist. As you move through the hexagrams gently pull the circlet over your wrist to get to the next row of beads. A circlet will go longer between restringing if it is kept well supported as it is used. Go through the hexagrams up to number sixteen at the end of the row. Continue through the rows, ringing the bell as appropriate at the end of each row, three, four, etc., up to eight bells at the 64th hexagram. I ring in groups of two like a ship’s bell. Touch the crowning bead to your forehead again and put the circlet away (or put it back on if it is a worn circlet). Or using coins: Heads is Yang, tails is Yin. The value of heads is 3, the value of tails is 2, thus a set of three coins form a set of four possible outcomes: 6, 7, 8, 9. These correspond to a Yin line changing to Yang, 6, a Yang line remaining Yang, 7, a Yin line remaining Yin, 8, and a Yang line becoming Yin, 9. Write out the results starting from the bottom and adding lines upward to form a hexagram. Conventionally you read the hexagram text and all changing line texts, but if the more than half the lines are changing you read the second hexagram text, i.e. the one on the right, into which the first hexagram has been transformed. However in Yi Dao we use a method to reduce all readings to one text. Add the numbers of the hexagram up, and we get 39. Our example produces line 4, which is changing, so we read that line. If there is one changing line, and it is a Nanjing line, read that, otherwise read the judgement. For two changing lines, if one is a Nanjing line then that line is read, otherwise the judgmeent. For three changing lines, the Nanjing line, otherwise both judgment texts. For four changing lines, the Nanjing line, otherwise the second hexagram's judgement. For five changing lines, the Nanjing line, otherwise the second hexagram's judgement. For six changing lines, the second hexagram's judgement. The bottom trigram name, the top trigram name, the hexagram name. Example: Below: Qian, The Creative, Above: Dui, the Marsh, Kuai, Judged. Recognizing the risks involved in criminal prosecution, justice demands a resolute proof of the culprit's guilt in the royal court. One informs one's own city that armed force is not necessary. In this way progress is assured. Resoluteness is the symbol of displacing or removing. We see the dynamic lines displacing the magnetic line. The figure displays the attributes of Strength and Cheerfulness. There is displacement, but harmony continues. The exhibition of the criminal's guilt in the royal court is shown by the magnetic line mounted on five dynamic lines. The awareness of danger and appeal for justice makes the matter clear. If he has recourse to arms, what he prefers will soon be exhausted. When the advance of the dynamic lines is complete, there will be an end to displacement. The image of the waters of a marsh mounting over heaven forms Resoluteness. The superior man, in accordance with this, does not hoard his wealth, but shares it with his subordinates. Yi Dao Morning Reading: 779788 Hexagram 34, judgment text. Yi Lin 46 - 34. This entry includes the Mei Hua (Plum Blossom Divination) hexagram for the hour of Morning Reading with the hexagram received by a random divination. It adds the hexagram pair from the Jiao Shi Yi Lin (Forest of Changes) that is appropriate as an answer if a question was asked. That brings us to another important point. You don’t have to ask a specific question at Morning Reading. You can just receive a text and use it as your lesson for the day, thinking of it and seeing if it applies to your day, or simply reading it to aid in knowing the text of the Yi better. Ideally the reading is done in Chinese, but your native language is fine. I use an edition of the Yi Jing that has Pinyin letters printed over the characters, so it is easy to read aloud. Yi Dao is neither a spiritual nor religious practice, so to paraphrase the popular phrase “I’m spiritual, but not religious” many Yi Dao practicioners are “ritualistic, but not spiritual.” The Yi Jing is a tool, a computer, and it can be used for infinite purposes and by infinite people, each with their own set of beliefs. There is no dogma of the Yi, per se, but there is a very close connection over the millennia with Confucianism, and some schools of Yi studies (Yi Xue), have arisen in Daoism and Buddhism both in China and overseas. There are Christian practitioners of Yi Dao and there could easily be Jewish ones, Buddhists, Moslems, Hindus, etc. Yi Dao cosmology is simply the current scientific explanation of the universe interpreted through the lens of the Yi figures and texts. I personally don’t accept the cosmology of any of the major religions because they are poor explanations of reality (Creationism, for instance, with its flat earth, stone firmament, etc. ); but even that does not interfere with the pursuit of Yi Dao. We meditate, though some have called our form more of a contemplation than a meditation. We visualize the universe and bring it inside our minds in the form of the figures of the tower and the hexagrams. We strive to see all of the figures at once; to get a ‘snapshot’ of the whole that lets us navigate life in comfort and success. In adversity we turn to the figures of the Yi to keep us on course, comforted in the knowledge that the universe in all of its mind-boggling vastness is one, and that we come from and return to the stars. As Carl Sagan said of our bodies: “We are all made of star stuff”. We cannot really guess at the nature of human life in eternity, but the laws of evolution and the conservation of energy suggest that all things fade and diffuse over stretches of time, but the system as a whole goes from crude to refined, a progressing spiral into…we know not where. That which is new holds on to that which went before in the persons of the ancestors and we make sacrifices to benefit those go before us into the future. Thus Yi Dao is a very family friendly path, as is its foundation, Confucianism. It is possible to internalize the figures without the texts; to make a model of the universe based entirely on your own concepts of how the trigrams interact in the hexagrams. However, as humans we need a place to attach ourselves, a cultural context. The texts of the Yi Jing and the Forest of Changes are such points. We stress ritual as central to life as did Kong Zi and Xun Zi, the ‘patron saints’ of Zhou Yi Dao. Morning Reading is a ritual. The differences between Sabbath and the rest of the days are a ritual. The way we deal with pleasure and pain, sickness and health and life and death are all ritual in nature. Read the first two hexagrams, Qian and Kun, in at least three editions of the Yi online and/or on paper. Yi Dao is a set of rituals and rules, not a religion, per se, but many of the trappings of our Way, our Dao, are similar to those of religions. We use a mala (the circlet), which is similar to prayer beads in other paths. We have a set routine we do daily, Morning and Evening Reading, which is similar to the prayers of other ways. Evening Reading is not done with the regularity of Morning Reading; or at least I don’t practice it. It is essentially the same as Morning Reading, but instead of studying a text from the Yi Jing we take a text from the Analects of Confucius, the Xun Zi, or a similar Confucian book to study, moving slowly through the book in daily ‘lessons’. So, after doing a circlet with bells, read the text, ring the bell once more, and then study the text in some depth, perhaps seeking out various translations, studying it in Chinese, etc. We have a day we set aside as special every week, which we call Sabbath or Shabbat, borrowed from Judaism. So Saturday is marked as a special day. How you make the day special is up to you. I am always involved in translation projects as my hobby occupation, so I set aside Saturday as a day in which I read and study and enjoy the day, but do no translation. It is possible to do more circlets of meditation on Saturday, but there is nothing obligatory and it is healthy to avoid doing too many circlets in a day. I’ve done up to 64. It’s exhausting and pushes everything else out of the day. I suggest eight circlets in a day (in addition to Morning and Evening Reading) as a maximum. When starting Sabbath, a circlet with bells is done (in my home temple the special ritual lights are turned on and the bell is moved to a position in front of my translation books, thus putting them off limits for the duration of Sabbath. The inner circlet, worn on the skin, is used to welcome the Sabbath, thus this is a time when we remember our dead. The inner circlet is also the one who’s crown stone is touched to the forehead of the dead when we part with them, so it is the most significant of the circlets, and it’s crowning stone is personally sacred. The inner circlet is only used to meditate at times of great trouble and sadness and at the start and end of Sabbath. For those in training who only have one circlet it will of course be used for all meditation and rites. So far we have spoken mainly of ritual meditation, performed with the accompaniment of the bell marking the end of each row and using the stones of the tower as well as the 64 hexagram stones. But the daily meditation of Yi Dao is less formal…and can be deeper. Without the accoutrements of bells and rites we can concentrate on the 64 hexagrams, visualizing each in turn, depending on the day, Yin or Yang. On a Yang day we look at the schematic meditation chart and visualize the traditional hexagram figures. On a Yin day we look at the traditional chart and visualize the schematic images. Those who have memorized the hexagrams visualize the figures appropriate to the day, schematic on Yin days, traditional on Yang days. Note that this contains a symbolic element. Since the first of any month is always a Yang day there is are slightly more Yang days than Yin in the year. This points to the nature of the universe having a slight Yang ‘spin’ to it, as mentioned elsewhere. Your breathing should be relaxed and deep. If there is some interruption it is best dealt with at a logical stopping point, the end of a row, but emergencies do happen, so there is no hard and fast rule. If you have been interrupted for some time it is best to start the row again. After each round of meditation on the circlet a counter is used to keep track of the rounds. How does this verse relate to your life?